RNDIS is Microsoft's solution for providing a networking over USB solution using their proprietary RNDIS protocol. 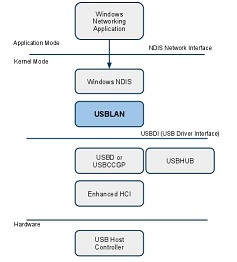 USBLAN for Windows is Belcarra’s solution for providing a networking over USB solutions using the industry standard protocols CDC-ECM, CDC-EEM and CDC-NCM. While there are no licensing costs associated with the use of Microsoft’s RNDIS driver this does not mean that the actual cost of deploying a commercial product will be less when RNDIS is implemented. Also support for RNDIS is limited to Windows based systems on the host side. This means that the device must still support another standard (such as CDC-ECM) for compatibility to Linux or Macintosh hosts. The DTM Client systems need to be maintained with all current patches from Windows Update and saved. The testing process requires installation of the “test driver kit” so these systems must have an image backup so that they can be restored to their original (plus updates) condition prior to each new set of testing. A proper Windows Installation Kit ensures that the customer experience for your device matches expectations. More specifically a seamless and silent installation that results in trouble free use of your device without support issues. To accomplish this a proper installation kit is required following Microsoft's standards and rules. This must be tested using the Microsoft Windows Logo Kit to ensure compatibility and then distributed using a Microsoft signed kit. This kit can be made available via Microsoft's Windows Update Driver service or distributed as an easily installable package for end users without a network connection. Belcarra’s USBLAN for Windows is provided as a complete ready to use kit that can be deployed using your VID/PID from Microsoft's Windows Update Driver service and as a ready to distribute kit for your end-users. This eliminates both the engineering costs associated with this process and reduces the time to implementation to zero.